If you are not naturally crafty, you may not be aware that knitting has burst back onto the scene as a form of social interaction, creative endeavor and community building. 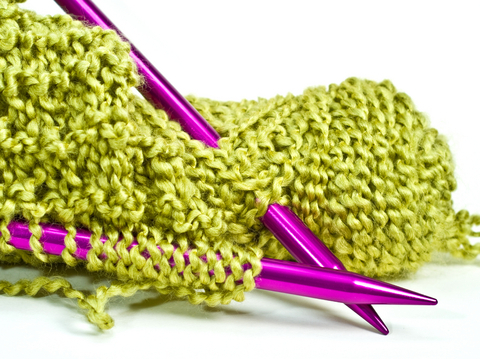 Many libraries and community centers already have adult knitting groups that meet, so you may be able to build on an already existing program. Have a strong knitter - Knitting can be very intimidating to the novice and it is helpful to have at least one experienced knitter to assist new knitters when they run into problems. If you are a strong knitter yourself then you're good to go - just be prepared to spend some time teaching and troubleshooting with your new knitters. Need a strong knitter - If you are NOT a strong knitter reach out to a local church, community center or specialty yarn shop; there are probably people at these places who are more than willing to donate their time to help teach new knitters. Start with a Workshop - Another option for starting from scratch (and a good way to gauge interest) is to host a Knitting Workshop. Schedule this program every evening for a week in one hour increments (any longer than an hour and teens tend to get very frustrated when learning to knit). For a beginning project try a simple scarf or wash cloth. Once you've completed the workshop plan on a once a week meeting for teens to knit, converse and relax. For the weekly meeting I recommend 1.5-2 hours allowing teens to come and go as they desire. A Knitting Group Already Exists - If your library already has a knitting group then talk to the knitters. Find out if they are willing to allow teens into their meetings (also see if the meeting time works with teens' schedules). Many knitters have a passion for what they do and are more than willing to pass on the knowledge. Extending a preexisting knitting group to a teen audience can be a great way to build inter-generational relationships and can act as a connection between the older and younger customers. Yarn - For new knitters inexpensive, acrylic yarn is often easiest to learn on. Try to gather both variegated and solid colors. Stay away from solid blacks or very dark blues and greens as it can be difficult for beginners to see the stitches on those colors. Needles - I recommend size 8, 9, 10 needles in wood or plastic. Metal needles are very common but are also very slippery and can be difficult to work with, especially for novice knitters. Scissors - Two to three pair of scissors should work for your group. As they become more knowledgeable knitters they will probably start bringing their own supplies. Binder of Patterns - Have a binder and stock it with simple patterns to start with. Be prepared for your binder to grow as knitters bring in patterns they enjoy or recommend patterns. The most important thing to remind yourself and new knitters is to BE PATIENT. Novices will not be able to create a masterpiece immediately - it takes time to learn different stitches and be able to complete different projects. Likewise it can take time to grow a knitting group. If you only start off with two or three teens that is STILL a success. Your group will grow as word spreads and your knitters start wearing and giving away projects they complete. Allow your group to form organically for best results.